Senior saved his best performance for last for Black Bears. It’s a nearly impossible task. 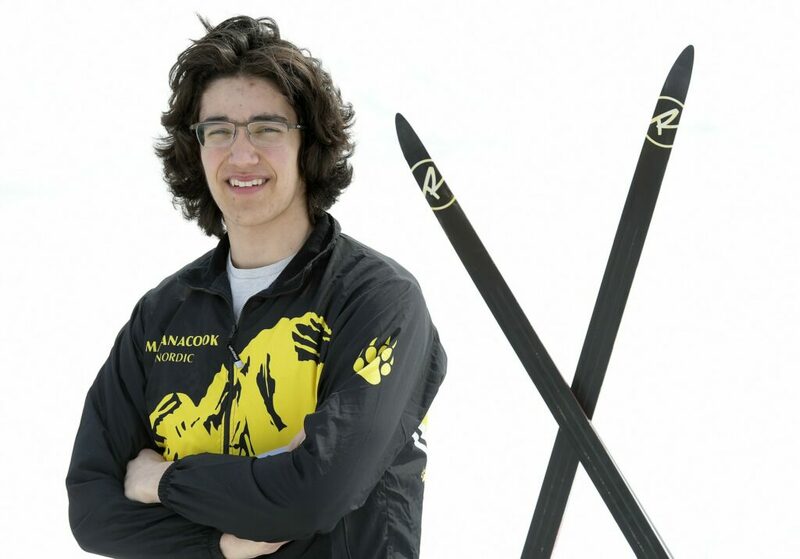 On the heels of its third consecutive Class B championship Feb. 19 at Titcomb Mountain in Farmington, the Maranacook boys Nordic team was led by not one, not two, but three skiers on its way to a title. And never was that fact punctuated more than the finish of the freestyle event, when Luke Bartol finished first, followed shortly by his teammate Gabe Fein, followed in third by fellow Maranacook skier Carter McPhedran. Bartol won the freestyle. McPhedran won the classical. But it was Fein, a senior, who edged Bartol by a second — and McPhedran by two seconds — for the pursuit title. And it is Fein who narrowly takes the title this season of Kennebec Journal Boys Nordic Skier of the Year. Bartol and McPhedran were also considered. A cross country runner during the fall, Fein entered the winter on the heels of a top 10 finish at the Class C state championships. Fein entered ski season looking for a successful run from the Black Bears as a team. Maranacook Nordic coach Steve DeAngelis said he was impressed with Fein’s training over the summer. Fein’s success on the Nordic course showed early this season. He finished second during the Maranacook Waves race on Jan. 19, bested only by Roy Varney of Leavitt. He finished third a week later at the Sassi Memorial at Black Mountain in Rumford. Fein carried that success into the postseason. At the Kennebec Valley Athletic Conference championships, Fein finished second in the classical, third in the freestyle and third in the pursuit. The only skiers Fein finished behind at the event was Varney and McPhedran. That led into Fein’s success at the Class B championships, highlighted by the storybook finish in the freestyle with Bartol and McPhedran. Fein credited both with pushing him to his best effort on the way to the pursuit title. The success of the trio helped lock up the Black Bears’ third consecutive state championship, the perfect way for Fein to cap off his high school career. Fein started his journey in skiing in elementary school. Fein gave credit to DeAngelis for helping him become a serious and successful skier after his sophomore season. Fein’s current plans involve taking a gap year and attending the Sugar Bowl Academy — a prep school for competitive skiers — in Placer County, California. “I think I’m going to stick with skiing as much as I can for as long as I can,” Fein said.